Did you know there are more impoverished people in the suburbs than in our cities? Although the poverty rate is higher in the cities, that data point about poverty in the suburbs is very real, even if it contradicts our long-held beliefs about suburban life. 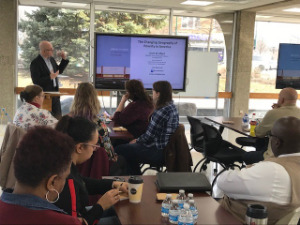 “We typically think of poverty as being an urban phenomenon,” explained Scott W. Allard at a community conversation held at the West Allis City Hall on March 28 sponsored by Community Advocates Public Policy Institute and the City of West Allis. 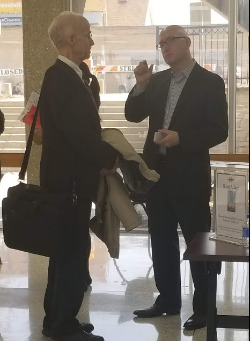 Allard, the author of Suburbs in Need: The Changing Geography of Poverty and a Professor of Public Policy and Governance at the University of Washington, presented his material with frequent discussion breaks to foster dialog among the forty-plus attendees. Participants offered up examples of human services providers not knowing how to talk about need with their suburban clients, workforce challenges that defy stereotypes, a lack of affordable housing near work sites in the suburbs, the conundrum facing suburban leaders who want to rebrand their communities to attract businesses and residents while also pointing out poverty as well, and not being able to find public or private grants that are targeted toward struggling suburban residents. 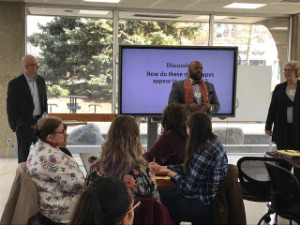 Allard said the way we think about poverty and location matters because researchers, funders, nonprofit organizations, and public officials often aren’t aware of the suburban areas, don’t know how to talk about it, or don’t have the resources to address it. He said we can address poverty in suburbs while continuing to alleviate concentrated poverty in our cities. "Poverty problems are much more acute in cities, and remains so, and they’re much more acute in communities of color in all places," Allard said. "But this conventional discourse has all kinds of downstream consequences for the work we do. First, it overlooks substantial need and depth of poverty in all parts of our communities. In all parts of our metro areas. In all parts of our country. I think the way we link place and race and poverty promotes bias in understandings of poverty. It ties poverty to some of our most pernicious racial stereotypes. It fosters the notion that poverty is a problem for others. When we talk about poverty in our suburbs as being ‘urban,’ that’s people who are not of us, they’re ‘others,’ and that means we don’t have the responsibility to take care of the problem, to address the problem. It leaves the responsibility to others to deal with." Allard said the growth of poverty in the suburbs is three times the rate of the total population growth of the suburbs, meaning that impoverished people aren’t simply moving from the cities to the suburbs. “It’s people becoming poor in place.” Residents are aging, plus immigrants are settling in suburbs instead of cities, and workers aren’t earning enough to maintain a good quality of life. “Not just about mobility and migration, it’s about people’s economic opportunities changing,” he said. In contrast to cities, which benefit from economies of scale in providing resources and services, suburbs struggle to connect residents with essentials they need to lift them out of poverty, such as food pantries, community health clinics, workforce programs, transportation, and affordable housing. Allard pointed to the federal Earned Income Tax Credit (EITC) and Supplemental Nutrition Assistance Program (SNAP) as two anti-poverty programs that work well and don’t burden the safety net. 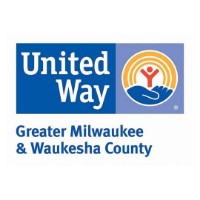 But he said that nonprofit human services providers’ expenditures dwarfs what is spent on those programs and are highly localized, often shortchanging suburban and rural areas because of capacity. So, what works? First, leveraging resources and relationships already in the suburbs – such as faith communities – can provide big benefits. In addition, gathering data on poverty in suburban areas can be useful when talking with policy makers and funders. He also suggested more collaboration among suburban and urban partners. 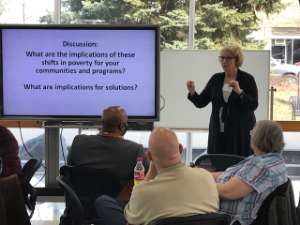 Julie Kerksick, Senior Policy Advocate at Community Advocates Public Policy Institute, recommended building bridges between city and suburban allies to engage decision-makers and strengthen policies and programs that will address poverty in all areas. 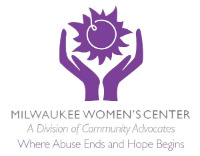 Too often, she said, policy makers assume Milwaukee is using up scarce resources, while suburban areas don’t have a need for aid for their residents. “I’m not going to pretend that we don’t have differences, but when we have these similar experiences, let’s find a way to talk about it that’s not judgmental,” Kerksick said. 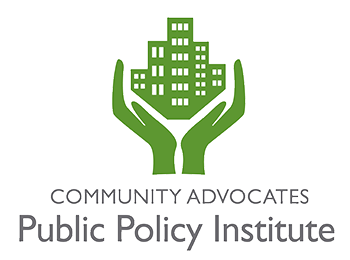 Want to connect with our work on poverty issues? Contact us.